2 bedroom self contained apartments, each sleeps up to 7 people, spacious open plan living areas with gas heating, kitchen facilities, dishwasher and laundry, washing machine/clothes dryer , electric blankets, ducted cooling, TV/DVD, hairdryer, all linen and towels supplied. Espresso machine, Plunger Coffee & selection of tea Provisions. Each apartment has a fully fenced private garden and undercover outdoor patio with Gas BBQ. Lock-up garage and off street parking. kitchen facilities, dishwasher and laundry, washing machine/clothes dryer , electric blankets, ducted cooling, TV/VCR/DVD, hairdryer, all linen and towels supplied. Espresso machine, Plunger Coffee & selection of tea Provisions. 27A Tolmie Street, located off Penola Road (right), North of the Jubilee Highway. 2 km North of the city centre. Mount Gambier is located between Adelaide and Melbourne when travelling via the Great Ocean Road. You could spend a week in Mount Gambier and enjoy lots of scenic day trips to visit Naracoorte Caves, Robe beaches, Beachport to enjoy driving on the beach and the Canunda National Park. Travel to Nelson, Victoria and enjoy river boat ride or canoe trip on the Glenelg River. Some guests have even taken a day trip to the Grampians National Park. Coonawarra Wineries and vineyards - 50 kms North. Only 30kms to the beach. We purchased the property and converted it from residential rental units into furnished accommodation in 2002 and have been a successful accommodation provider in Mount Gambier for more than 15 years. Having 4 apartments located together enables group bookings of multiple families who wish to stay together. Lovely and clean. Secure backyard for our little dogs and really well prepared house to stay in: it had everything from cling wrap to laundry pegs for us to use! we loved this property. It was quiet, clean, comfortable and had everything we needed. electric blankets, coffee machine, tv. It was only a few minutes drive to the main street, hotels, fast food outlets and shopping centres. We would definately stay here again. Felt like home, spacious, everything you might need has been thought of and provided. 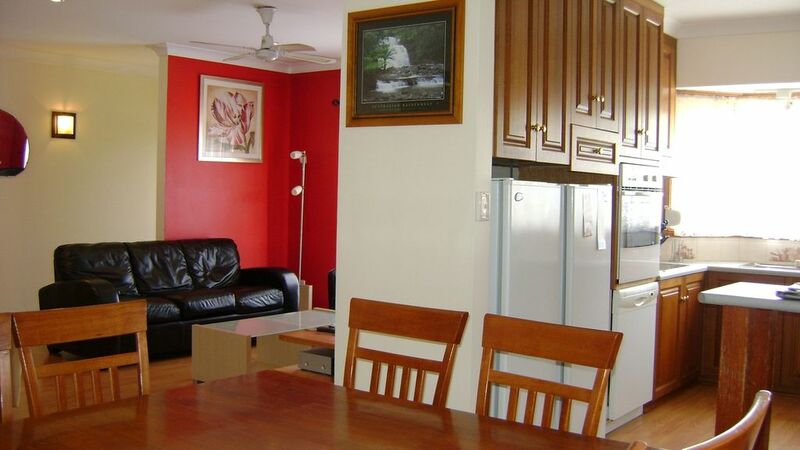 Very clean apartment with all you need for your stay. Very important point for us - pet friendly. A spacious apartment with lots of extra little touches (dressing gowns, food items in the pantry, kitchen tools etc.) to help make your stay more comfortable. However some things required further attention and repair. We would book and stay again. Had a great stay in Mount Gambier. Apartment had everything you could possibly need for a few days away from a wide selection of teas, coffee and Milk in the fridge to bath robes in each room. It felt like home away from home!! Thankyou we are pleased you have a great stay.